Nurse Ratched's Place: How The Grinch Stole Christmas...Again! History is repeating itself. This is what Mr. Grinch wrote in this year’s Christmas card. This has been an exciting year at the Most Wonderful Hospital in the World. We have a brand-spanking new emergency room, and wide screen TVs in all of the patients’ rooms. Patients also have access to wireless Internet services from their rooms, and we have installed an expensive water fountain in our newly created serenity garden that you can go stare at when you are all stressed out. And let’s not forget about that new gourmet coffee bar we have in our new Hilton-styled front lobby. Yes sir, we rock! Unfortunately, all of those improvements have been very costly, and they didn’t entice new patients into coming to our hospital, so that means that you are not getting a Christmas bonus from the hospital this year. However, we encourage you to donate to a fund that we have created that will benefit our poorest employees. You may write a check, or you may donate to the fund through payroll deduction. See, we really do have a heart. I went to work the next day after receiving the good news about our Christmas bonus, and I noticed that I was not the only employee who was upset by Mr. Grinch’s letter. I walked down to the new garden in search of serenity, and I noticed crumbled copies of the letter floating in Mr. Grinch’s new expensive water fountain. Merry Christmas to you, too, Mr. Grinch. There are Mr Grinches all over the place. what's a Christmas bonus? I thought they were a myth. Never have I seen one. But at least I don't have to sit through insulting letters year after year. Let me see. Last year I deducted 200 dollars from my paycheck to assist in getting a matching grant to pay for a new cardiac ablation lab at my facility. I truly did this out of the goodness of my heart, because I know that it will give quality of life to patients who suffer from tachycardia. Sorry about your hospital. Not to brag too much.... ahem.... Our facility gives a "holiday gift card" to cover both Thanksgiving and Christmas. Fifteen dollars worth of anything but liquor and nicotine at the local grocery store. Our facility is health conscious of course so they don't want us involved in vice. Naturally, a nip of the bottle and a smoke sounds pretty healthy to me after long shifts where we all go home stressed. And they wonder why R.N. 's are leaving the hospital settings to never return? 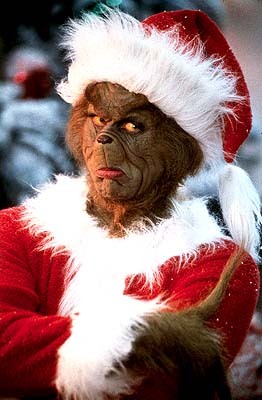 Yes, Merry Christmas Grinch! If you want to float my gift card in your serenity pool I will send it along! Hurrah! It really, really is a travesty. Last year for Christmas I got a letter asking for donations to the hospital. I would have donated if I knew the money would go towards hiring more staff. But I knew it was going to go towards the "new" extremely redundant and ugly entrance they were building to the hospital. Oh, and towards new shrubs to stand around the hospital for everyone to stub out their smokes in. Yeah, guys at the top who drive their Rolls Royces and treat their employees like crap make me want to vomit. The only "bonus" I ever got was the option to work Christmas day or Christmas eve. No bonus for just about anyone here in Oz. But my most recent Grinch-in-residence seems to have taken the cake. We have only 11 residents in our aged care facility; it is delightfully personal. Last Christmas, when the issue of the Residential Christmas lunch was brought up, she wanted to know why we had one. And was aghast that we actually provided them with a small Christmas gift that was delivered by "Santa" on the day. "Who pays for all this?" was her response. We refused to relent on this, and staff payed for gifts and supplied some lunch goodies out of our own pockets. Well, this year, at November's residential aged care forum with the residents and their families, she announced that "there would be a Christmas morning tea following the December meeting, so could families all bring a plate of goodies to share, and a gift for their family member, which would be delivered by "Santa"". We were gobsmacked by her lack of good spirits, and utter mean-ness. Usually, we also invite along regular volunteers to share in the good food and festive tidings as a vote of thanks for their support throughout the year. Apparently, this won't happen either, but "can you organise for the minister please come and perform a Christmas service the day before Christmas, and the musician provide some Christmas carols for the "Christmas party"... Ahem. Rude. Mean. Disappointing. Some residents don't have family that will be in attendance at the "Christmas Party", or that will care enough to provide a gift for them.